Sofas There are 71 products. 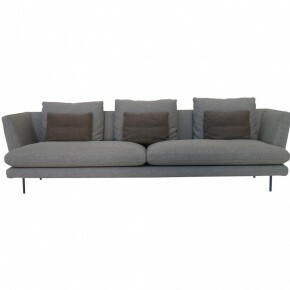 Lowland sofa by Moroso has essential lines. Patricia Urquiola, who designed it in 2000, started from a deconstruction process of shapes: Lowland is composed of three formally-separated elements which have been redesigned and reassembled to create a linear sofa that preserves its formal elegance. Spring is a modern sofa made of fabric, designed by Patricia Urquiola in 2010 for Moroso. It is a modular sofa that, despite the small dimension of each individual module, maintains the elegant comfort of an important sofa. Polished aluminum alloy feet. Steel frame. Elastic strips suspension. Backrest and seat upholstered in graduated polyurethane. Removable cover in fabric or leather. The price refers to the lining in category 30.